Surprise surprise the musical by David Byrne and Fatboy Slim is absolutely fantastic. It's not as if iconic musicians haven't come unstuck in heading towards musical theatre before, but let's face it, if anyone is going to make a goddamn amazing musical about the corrupting influence of materialism, it's David Byrne (with Fatboy Slim more than capable of supplying some cool beats). 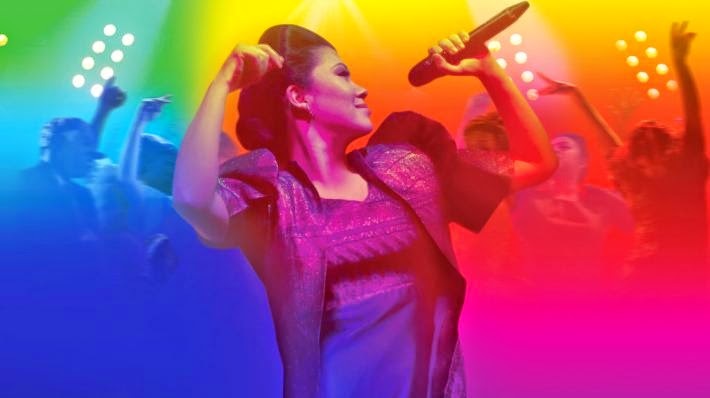 Here Lies Love is a musical biography of Imelda Marcos, widow of Phillippine President Ferdinand Marco. Beginning as a 'simple country girl' sleeping on boxes in the garages of Tacloban she claws her way towards opulence on the back of her rmarriage. From its beginnings as a populist movement led by a war hero their regime gradually slides towards authoritarian tyranny, with Imelda effectively ruling the country in the 1980s. Eventually the situation becomes untenable, concluding with the peaceful 'People Power Revolution' of 1986 that forced the Marcoses to flee the country by helicopter. Following her departure the poor of Manila ransack the palace, famously discovering her gargantuan shoe collection. Them's the facts, so how do they work as a musical? At the core of Byrne's vision is the idea of experiencing history in a nightclub. The audience are everywhere; gazing down at events from high above the stage or standing around a transformable stage. The cast move in and around us, at times hugging us and incorporating us into their choreography. This constant motion gives the show a unique energy; seducing us with the extravagance of the Marcos lifestyle. Musically this is firmly, fiercely and religiously pop inclined. 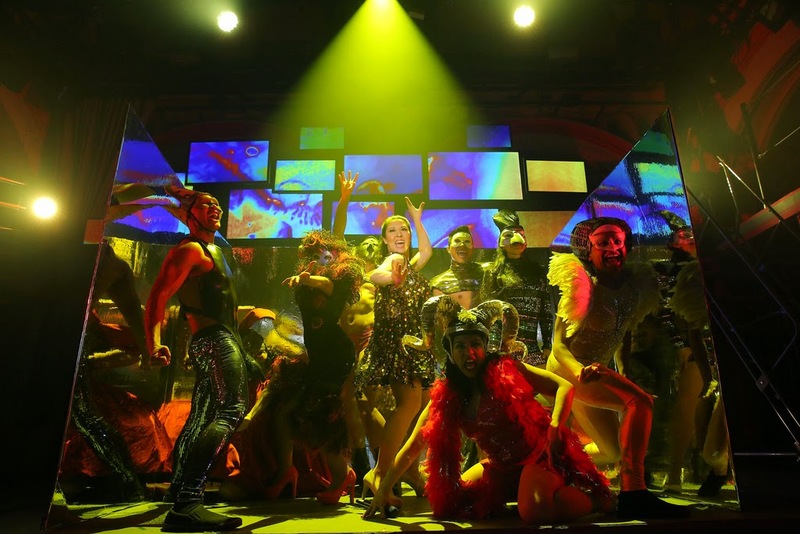 The show has rightly been described as a 'poperetta', stuffed full of gossamer light synth beats, booty-shaking disco bass and catchy choruses that all but beg to be sung along to (and we do). Obvious highlights are the recurring title track, Here Lies Love (which gets its title from what Imelda wants engraved on her tomb), We Are The People of the Philippines and the climactic Why Don't You Love Me? All the songs are covered in Byrne's distinctive lyrical fingerprints - it's all too easy to hear his voice in this music, no matter who's singing them. There's a risk that translating the life of Imelda Marcos into super fun happy disco times would trivialise her crimes against the people of Manila. After all, underneath all the shoes, fur coats, haute couture and partying lies torture, despotism and corruption. Here Lies Love is even broadly sympathetic to Imelda, though the triumphant climax involves her being unceremoniously booted from the country, her panicked lack of comprehension renders her more pathetic than outright evil. Instead, Here Lies Love shows how the understandable desire to escape poverty becomes monstrous when taken to its logical conclusion. The young Imelda is practically a Disney heroine in her misery, singing pleasant little ballads about how she's the flower in a ruined world, she's practically Cinderella. 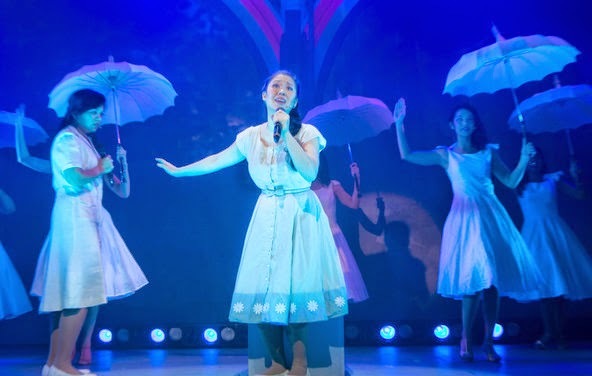 Imelda gets her fairytale ending about a third of the way through the play, winning the heart of not only her dashing Prince Charming but of the people. Here Lies Love is about the consequences of living out your fantasy life. Money is the root of all evil, and once the addiction of materialism has gotten its hooks into this poor country girl she begins a metamorphosis that's the equal of anything Kafka or Cronenberg put out. This is as much a visual transformation as it is a narrative one; after beginning the show in a simple, white peasant dress with her hair loosely around her shoulders she begins to become angular and insectoid. Her hair tightens into a hard beehive, her outfits harden into a chitinous carapace of iridescent green with wing-like fins - even her features seem to grow harsher under the high-contrast stage lighting. We can almost see the humanity draining from Imelda as the show goes on, the innocent peasant systematically replaced by the legendary 'steel butterfly'. This steady transformation is contrasted with the unchanging innocence of Estrella, her childhood friend. The unsettling conclusion is that there's nothing unique or special about Imelda the person; rather that she threw herself into a machine that warps people into monsters. So Here Lies Love functions as a broadside against the precise kind of fun we're having so much of. When we jiggle our asses to Fatboy Slim's eminently danceable beats, become drunk on the elaborate stagecraft and marvel at the astonishing costumes we're proving ourselves susceptible to the same temptations that created this supreme villainess of shoes. Of course this is very much having your cake and eating it. Here Lies Love is one of the most joyous musical experiences I've had all year. And therein lies a paradox. Audiences skip and boogie out of the stage door, pumped up for more partying and humming the show's eminently hummable tunes - on their own individualistic paths to awfulness. It's a sensation that leaves you giddy and queasy in equal measure. Be sure to experience it for yourself. Here Lies Love is at the National Theatre until the 8th of January. Tickets here.